A recent weekend saw evidence of the Olympic legacy, when over 50,000 cyclists took to the closed-off roads to haphazardly weave their way around an 8 mile circuit in central London. All ages and abilities were present, from kamikaze youngsters seemingly oblivious to the dangers of suddenly veering off in unpredictable directions, to pensioners, seemingly oblivious to the effect that their choice of tight-fitting clothing had on the sensibilities of the following cyclists. And it wasn’t just the elderly who made poor fashion choices. 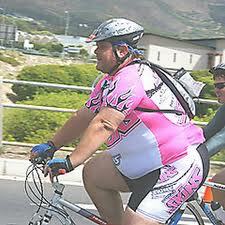 Several overweight cyclists also felt the need to attempt to stuff their frames into brightly coloured lycra. They looked like radioactive badly stuffed sausages. The bottleneck at The Mall presented everyone with an unwanted opportunity for lingering views of the offending outfits. So why do they do it? The most common defence is that it is comfortable. The padding eases any aches and the tightness aids smooth cycling. However, there are padded shorts that aren’t skin-tight and it’s fair to say that many of these cyclists do not ever cycle the kinds of distances that would necessitate wearing lycra for speed or to avoid chafing. Unless you are competing, wearing normal shorts will have minimal effect on your ability to pedal. It’s not as though the wind drag will slow you down. Maybe an alternative reason is that people tend to act like sheep. They’ve made the decision to become a cyclist and they see others wearing lycra. So that must be what you are supposed to wear. Any notion of individualism goes out the window. It’s just the done thing. One final explanation is that maybe some cyclists suffer from a degree of pretentiousness. This is especially evident with road cyclists, as opposed to those riding mountain bikes or standard bicycles. They’ve spent £1000 on the latest super light road racing bike, with thin frame and bald tyres (because having tread would really slow them down on the commute to work). They want people to envy their new status symbol and be impressed by their sporting prowess. They are far superior to other cyclists. Just like we see in nature’s mating rituals, they feel that displaying their wares in brightly coloured outfits will make them stand out from the crowd and be noticed. And it’s fair to say that they will certainly be seen. But 9 out of 10 of them will be looked at for the wrong reasons. An initial glance will be followed by a masochistic second look that you will hate yourself for taking. But just how do they stuff themselves into that lycra, you wonder. Vaseline and a shoe horn perhaps? ← Someone Leaves His Card in the ATM. What Would You Do?